It’s time to put a high-end 1440p dash cam in your car for an amazingly low price of just $89.99. It’s packed with features and has amazing tricks up its sleeve. Drivers know that sometimes having a recording of what happens on the road can be super important in all manner of situations and should something awful like an accident happen, it can be a vital part of any investigation. 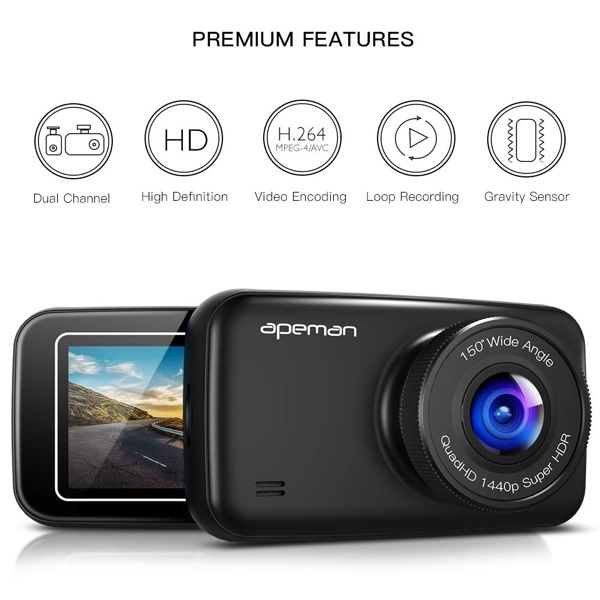 Thankfully, getting a great dash cam doesn’t necessarily have to cost the Earth, and the folks at APEMAN make some great cameras that are already well priced given the features they offer. Right now you can get your hands on one of their high-end cameras at a super special discounted rate, too. The camera in question is a 1440p affair that also offers a full HD 1080p camera for recording the rear of the vehicle, too. Being able to record what happens behind a vehicle is great if an accident occurs and having a full HD capture is important for being able to read license plates etc. A built-in G-sensor automatically detects when there is a collision too, automatically starting a recording if one is not already underway. That all sounds pretty great, and at it’s normal asking price of $120 there is a lot to like here. But right now this can all be yours for just $89.99 when you enter our special discount code at checkout. Other features include a 2.7-inch LCD widescreen display as well as picture-in-picture playback. All of this comes with a 12-month warranty as well as a free returns policy within the first month.